In this article I will talk to you about a less known feature of Windows Vista, called the Send To menu. Even though it is also found in older versions of Microsoft Windows operating systems, not too many people notice it and use it. Simply put, the Send To menu allows you to quickly send files and folders to another location. In this tutorial I will show you how to use this menu and how to add other useful entries (locations) to it so that you can be more productive when you need to move files to a certain location. 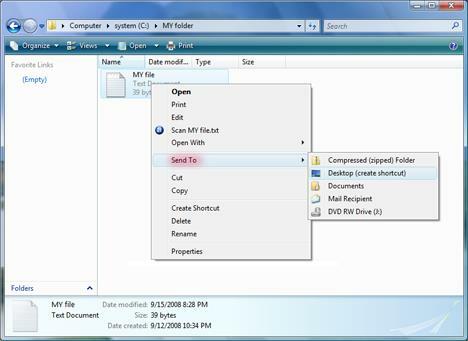 To use the Send To menu, all you need to do is to right click your desired file or folder and click on Send To. 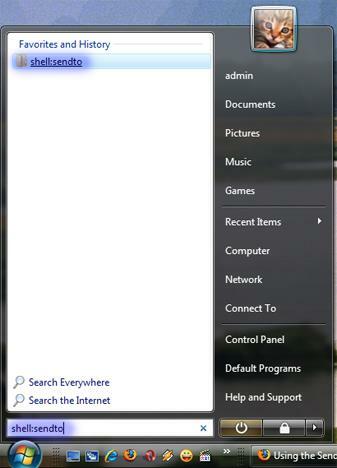 In the Send To menu you can see places where you can send your files or folders. 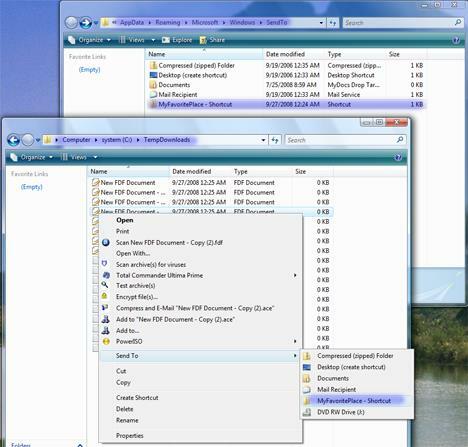 By default, the places where you can send a file or folder are the following: all your so called 'removable drives' such as the memory sticks that are plugged into your computer, your CD/DVD-RW drives, a 'Compressed (zipped) Folder' which is the equivalent of archiving the selected file or folder, your Desktop which is the equivalent of creating a shortcut on your Desktop towards the selected file or folder, your Documents folder and 'Mail Recipient' which means attaching it to a new e-mail message using your default e-mail client. First, click on the Start button and, in the search box, type 'shell:sendto' and click on the shell:sendto search result or press Enter instead. The Send To window will appear. If you can't get to this folder by following the procedure above, then open Windows Explorer and type '%AppData%\Microsoft\Windows\SendTo' into the address bar. In the Send To window you can add your own favorite places where you want to send other files or folders. Once you have decided about the place where you want to send other files or folders, create a new shortcut of that favorite place in the Send To folder. You can create shortcuts toward a folder, a disk drive or a program. If you don't know how to create shortcuts, you can read this tutorial to find out how to do it. Once you have added all the shortcuts you wanted to the Send To folder, you can right click on any file or folder from your computer and send them to any of your new favorite places. If you want to remove a location from the Send To menu, just delete its shortcut from the Send To folder. Important: By default, when using the Send to menu, you just send a copy of the selected file or folder to the preferred place. The file or folder will also remain in its initial location. If you don't want to have a backup copy then right click on that file or folder, go to the Send To menu, press the Shift button from your keyboard and, while still holding it, click with the mouse on your preferred destination from the Send to menu. This will be the equivalent of making a 'Cut and Paste' procedure in Windows Explorer. How to avoid problems: As an advice, do not overload the Send To list because it will load much more slowly. Also, if you add to many applications, the Send To list will become very crowded and it will be hard for you to find what you seek. A better choice for opening a file in different applications would be using the Open With option or setting the default programs for opening specific file types. All I want in the Windows file context menu "send to" list, is a browse function. Thx for the "+" hint. Type "send to" into Help, and the first 60 entries don't even mention the send to menu! In W98 you could put nested folders full of shortcuts (like a copy of your documents filing system) into the send to folder, and this came out as cascading menus, just like the start menu does. Can vista be made to do this? I really miss it, it was a very quick way of filing. There's no point sending a file just to "documents" if you want it 2 or 3 levels deeper. A suggestion:- Always keep your documents in a seperate partition from Windows, then you don't lose them when Windows has to be reinstalled after a crash!